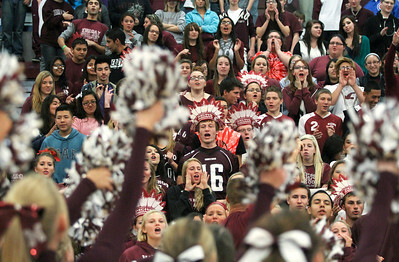 Marengo Community High School held a homecoming pep rally Friday, October 12, 2012 in Marengo. Marengo wraps up homecoming week with a varsity football game against Rockford Christian tonight. 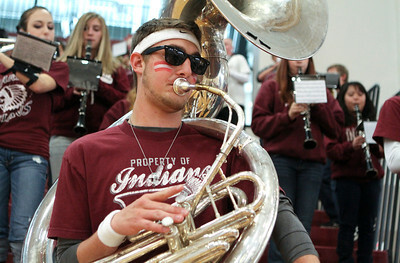 Mike Greene - mgreene@shawmedia.com Junior Mitch Hogan, 16, plays with the band during a homecoming pep rally at Marengo Community High School Friday, October 12, 2012 in Marengo. Marengo wrapped up homecoming week with a varsity football game against Rockford Christian. Mike Greene - mgreene@shawmedia.com Seniors are lead in a cheer during a homecoming pep rally at Marengo Community High School Friday, October 12, 2012 in Marengo. Marengo wrapped up homecoming week with a varsity football game against Rockford Christian. 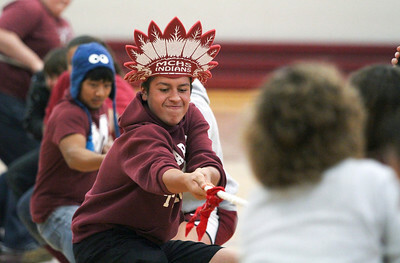 Mike Greene - mgreene@shawmedia.com Senior Aaron Deleon pulls a rope with classmates while facing a group of teachers in Tug of War during a homecoming pep rally at Marengo Community High School Friday, October 12, 2012 in Marengo. Marengo wrapped up homecoming week with a varsity football game against Rockford Christian. 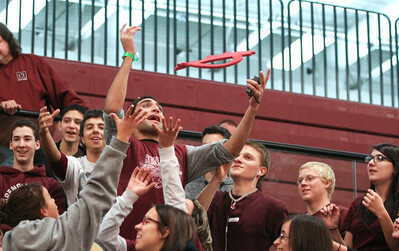 Mike Greene - mgreene@shawmedia.com Senior Steve Galante reaches out to catch an Indian headdress during a homecoming pep rally at Marengo Community High School Friday, October 12, 2012 in Marengo. Marengo wrapped up homecoming week with a varsity football game against Rockford Christian. 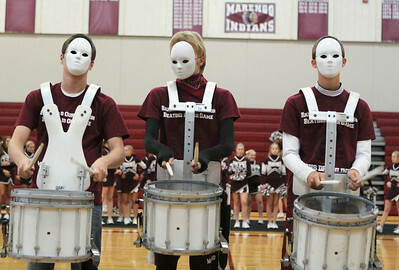 Mike Greene - mgreene@shawmedia.com Drum line members Jesse Darlington, Malachi Allgood, and Weyland Heimer perform in masks during a homecoming pep rally at Marengo Community High School Friday, October 12, 2012 in Marengo. Marengo wrapped up homecoming week with a varsity football game against Rockford Christian. 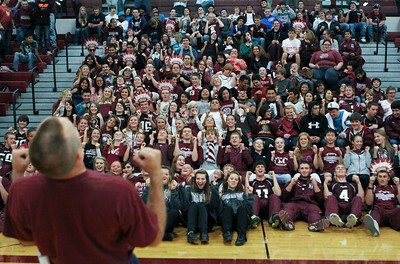 Mike Greene - mgreene@shawmedia.com Dan Schirmer leads the senior class in a mock roller-coaster during a homecoming pep rally at Marengo Community High School Friday, October 12, 2012 in Marengo. Marengo wrapped up homecoming week with a varsity football game against Rockford Christian. 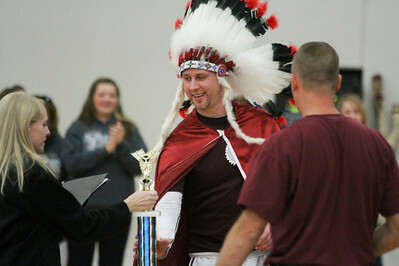 Mike Greene - mgreene@shawmedia.com Teacher David McCafferty accepts the teacher spirit award during a homecoming pep rally at Marengo High School Friday, October 12, 2012 in Marengo. Marengo wrapped up homecoming week with a varsity football game against Rockford Christian. Seniors are lead in a cheer during a homecoming pep rally at Marengo Community High School Friday, October 12, 2012 in Marengo. Marengo wrapped up homecoming week with a varsity football game against Rockford Christian.